Marketers know that you need a certain amount of masculine cache as a guy to talk about guy stuff. Think about it: George W. Bush could talk about war all he wanted because he cut brush and had a Texas twang. And then there’s Michael Dukakis riding in a tank…not so much. It doesn’t always make sense, but when it comes to masculine cache, you’ve either got it or you don’t. 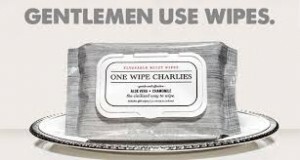 Well, the NFL is kicking butts (and making bucks) with One Wipe Charlies. Football players are the closest to unimpeachable when it comes to masculine cache as you can get. That’s why marketers are starting to enlist them to sell stuff to guys that guys don’t usually like to talk about. There’s no better example of this than One Wipe Charlies, which is featuring the (clothed) backside of center Travis Frederick to advertise its product. It’s counterintuitive genius, partly because it calls attention to something guys like to forget about anyway, namely that football involves reaching for balls through a lot of butts. One Wipe Charlies is striking while the iron is hot. There’s been a breakthrough of NFL marketing recently, with several NFL stars being featured in an ad for Depends adult diapers. And even with the NFL players enlisted, the Depends marketers seemed worried about the masculine cache level, so they brought in Snoop Dog to mutter incoherently in support of one of the NFL stars. Good marketing works with a solid mix product, audience, and value proposition. Forbes Contributor, Jonathan Salem Baskin, is not hopeful for this new product in his, “Dollar Shave Club Set Wipes Won’t Work In The, Er, End,” Dollar Shave Club put a smart foot forward with this provocative, smart sponsorship. The only question remaining is, how else will these four NFL centers be used? Here’s the video. You’re welcome. Good post Howard Davidson Arlington Massachusetts…you have a witty sense of humor and I appreciate it…Some clever selection of words all in all worth a read!